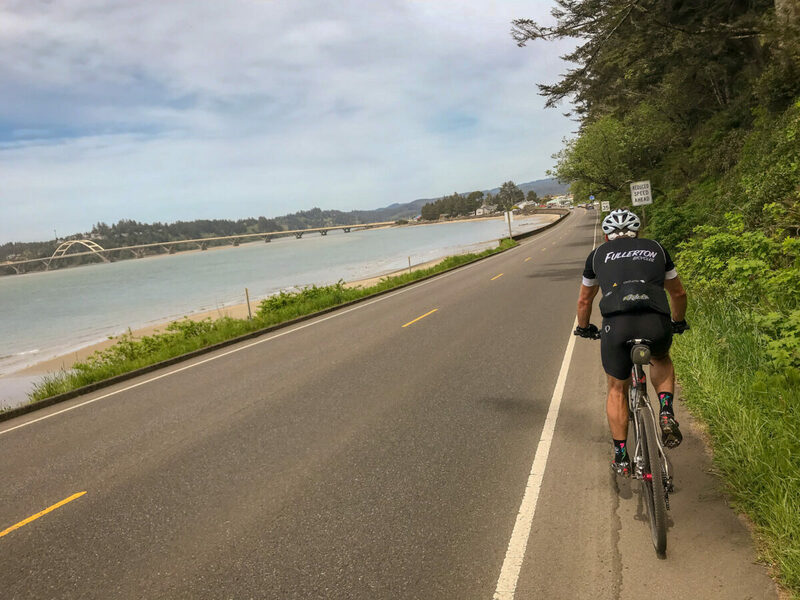 Riding in a narrow shoulder just south of Waldport. 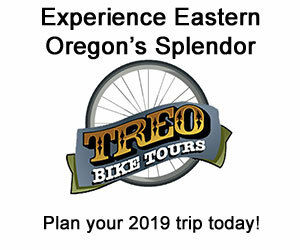 What iconic Oregon bikeway is 370 miles long, connects 38 campgrounds, supports 670 full-time jobs and spurs $56.3 million in tourism spending? The Oregon Coast Bicycle Route (OCBR). And it does all that despite a lack of strategic planning or updates since it was established in the early 1980s. Now that will finally change thanks to an effort by the Oregon Department of Transportation that has taken a significant step forward. As we reported back in January, ODOT has been working on a major update to the OCBR. This morning they launched an online open house and they want your feedback on how to improve the route and to make sure the plan is headed in the right direction. The public has a chance to provide input and share ideas about improving the OCBR by visiting an Online Open House through Jan. 31, 2019. The public input and ideas will help ODOT to better understand where the issues and gaps are along the route. 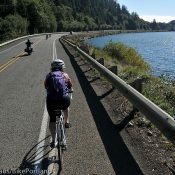 While ODOT does not currently have funding identified for improvements, the Oregon Coast Bike Route Plan will set the stage for future investments. The plan will identify needs and prioritize improvements to the route to increase safety, accessibility and enjoyment for residents, visitors and all users. It has been over a decade since the OCBR was evaluated and no comprehensive planning work has ever been completed. 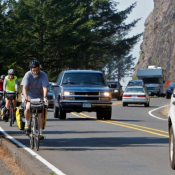 With the changes in bicycle infrastructure standards, and the growth of bike tourism destinations and travel options both nationally and along U.S. 101, ODOT believes it’s the right time to do this work. Screenshot from online open house. 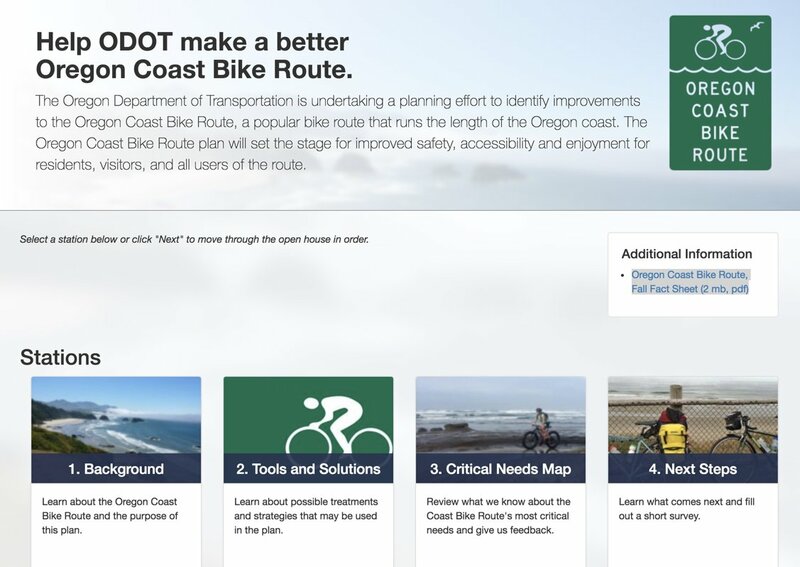 Once complete, the new Oregon Coast Bike Route Plan will define the route, identify ways ODOT and local agencies can make it better, and create a list of high-priority projects. The online open house features an interactive map of specific locations where ODOT is considering improvements. You can learn more about the background of this project, view potential changes, see what the critical needs are, and view next steps via the online open house. I generally stick to the southern half of the coast when I ride to CA. The primary issue is the pathetic situation at each and every bridge. Could we at least get some “Bikes May Use Full Lane” signs up on those things? I did the whole Canada -> Mexico Pacific Coast route during the summer of 1997. I had a great time. Even back then I felt that the route was pretty good overall. Some of the shoulders were a bit narrow. The only crappy part was a tour bus driver bitching about “all the damn” bikes within earshot of me, then some of his customers scowling at me. Remarkably I just said hi to them and kept on going. Well, there was also an RV trying to turn around in the middle of 101, snapping off a Coast Bike Route sign. I would suggest this route to anyone, it is a great time (just head south!) If possible, try and have hangout/bike nowwhere days on the weekend, it is MUCH more pleasant to ride Highway 101/1 on a weekday. I won’t ride it. Not pleasant, not safe. I rode from Astoria down to Santa Monica in 2004. I agree that the Oregon section was alarming in many spots — there are too many places with a narrow shoulder or no shoulder, and too many RV drivers that would rather squeeze you than use their brakes. These two factors make a bad combination. I’d say a minimum 4-foot shoulder protected by a rumble strip for the whole route would do a lot to open it up to a wider audience…I know the chances of that happening are pretty low though. A few years ago I road along the northern coast (Astoria-Pacific City). I moved to Tillamook this this summer and have yet to ride on 101. I have no plans to either. I see far too many cars driving over the white line coming around turns. I do not trust my life with distracted tourists looking out their side windows admiring the view. Filled out the survey, commenting on about 5 different specific spots I felt like I had decent enough input on! Most the solutions they proposed were route/infrastructure based, and my biggest comment was similar about driver behavior being the biggest deterrent for me. ODOT MUST act now for 2019 and DECLARE a traffic safety emergency each summer and mandate [due to over capacity conditions] and restrict out of state RVs to only drive northbound on 101 and use I-5 for southbound travel outside of towns. This would ease some of the pressure on pedestrians and the touring cyclists* having to travel along the often narrow shoulders next to the precipices…due to south bound prevailing winds and public recreational facilities being along the coast side. Its time to start communicating this change, signage, and marketing it regionally. ODOT don’t need 2 years of planning and meetings to do this. Instead of removing any motor vehicles, ODOT seems to have settled in on removing bikes via shuttles. That’s beyond awful, imo. I remember when CalTrans used to have on-demand shuttles across two Bay Area bridges (Carquinez and Martinez). It was simply awful and was eventually remedied. Shuttles are anti-bike, in that they say bikes don’t belong on the road, so no wonder ODOT is jumping right into this failure from history’s dust bin. I’ve ridden most of the OCBR. Admittedly, it’s not great and it would take lots of work and money to make it great. It’s disappointing that more hasn’t been done by ODOT, tourism agencies, cities and counties to improve and promote it. My experience riding the OCBR was that 85 percent of motorists were pretty cautious and accommodating – moving into the on-coming lane or at least moving to put their left wheels on or close to the center lane or slowing to find a better spot to pass bicyclists. Ten percent of vehicle operators stayed exactly in the center of the lane and simply hoped that it provided enough room for the cyclist. Five percent of motorists thought it was their duty to make sure cyclists were aware that they were not welcome by moving closer to the cyclists, using their horn to indicate displeasure at the cyclists presence, or even worse behaviors. OSP to undertake some selective enforcement actions using decoy officers on bikes supported by motorcycle and patrol cars to cite motorists who deliberately put cyclists at risk and educate those motorists who are simply unaware. In fact, bike riders on the OCBR are not so rare that one motor vehicle mounted officer could not observe and cite MV drivers for dangerous behavior. If officers cruise through or park near some pinch point a sufficient number of “volunteer” bike riders and scofflaw drivers will present themselves . Police work is dangerous enough without taking officers out of their comfort zone–a motor vehicle. Institutional commitment is really all that is required here. 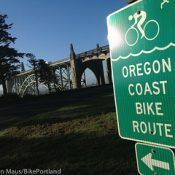 I’ve ridden on the Oregon coast at various times, once from Tillamook to Humboldt County, CA. I didn’t have any Very Bad experiences, would do it again, but I would recommend it with an asterisk to other people. It would be a lot better with amendments to the top five (or maybe top ten?) sketchy places. Absolutely any repaving, regrading, or modifications to bridges should be done with consideration for bicycle passage. If I ride the coast route again I would plan on taking the time, and the tires, to make use of roads off the beaten path as much possible. Fewer motor homes, fewer people trying to drive fast on roads that aren’t built for it. 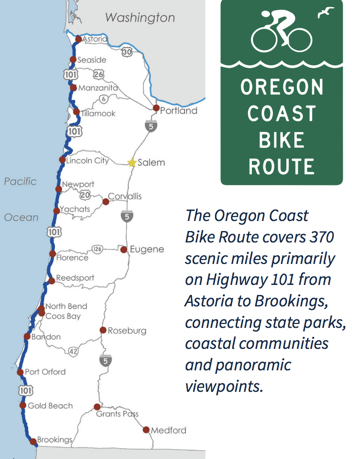 I’m not sure what makes the Oregon Coast Bike Route a bike route. It’s a very scenic highway for autos. There happen to be a number of bicyclists despite the dangers. Is there any bicycle specific design or infrastructure whatsoever besides some paint and some signs? For ODOT to call this a bike route is audacious, but at least they are looking into making some bicycle specific improvements. It has markings to direct cyclists to safer or more desirable roads where possible, beg buttons for some of the worst bridges/tunnels, and bike camping spots at some of the parks. That’s pretty much all I remember to differentiate it. 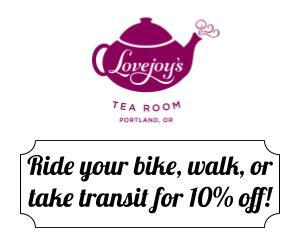 Most ideal (while costing more money) is a separate trail that is multiuse that parallels Hwy 101. Think Banks Veronia trail along the coast. This trail would connect to actual bike lanes and maybe detour around those super narrow tunnels making the trail more meandering but maybe more scenic with views. A pipe dream but that would be best and safest. 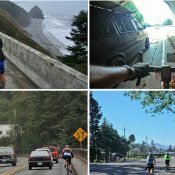 Cyclists can mitigate the risks of riding along the 101. Bright clothing, more than one light on the rear. I ride with 2-3 lights on, also a headlight on during the day. I had a fellow bicyclist catch up to me once who said ‘I saw you up ahead and first thought you were a police car’. Sunny days are deadly for cyclists on the coast. Bright light and shadows, drivers with sunglasses on. As a driver going from bright light to tree-shadowed roadway you cannot see anything! Lights on the rear of your bicycle are particularly effective for reducing the risk. Picking your time of day to cycle is also helpful. Getting on the road after 9:00 A.M. to avoid the commuters (especially the angry tradesmen. They are a rough bunch) And getting off the road by 3:00 P.M. to your hotel or campsite. You can’t get around it. Astoria to Coos Bay is busy, busy. South of that, Seven Devils all the way to Cal state line, is a glorious experience. I’ve done it many times and will do it again!